The locks in this category were designed and manufactured by Kevin Moreau of The Plumb Farm Workshop's. Plumb Farm Workshops is located in the historic Estey Organ Complex in downtown Brattleboro, Vermont. The forging area is a fairly traditional small blacksmith's shop with coal forge, anvil and vises. All work is done by hand in the traditional manner; the only concession to modernity is the use of electricity for light, drill press, and grinder. Kevin Moreau began experimenting with forged and otherwise manipulated metals in 1980. Since then, he has worked as a production blacksmith, boat builder, and musical instrument maker. 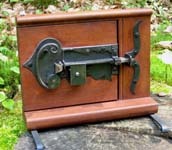 Since starting Plumb Farm Workshops, Kevin has concentrated his metal working talents in making iron locks for doors, furniture, and as collectable art objects. "I like to maintain an intangible, graceful quality of antiquity, while exploring the possibilities of mechanical whimsy and the tactile delight of handmade metal objects. Locks and keys provide almost inexhaustible opportunities for texture, embellishment, and complexity." While Kevin is quite competent in the traditional conventions of ages past, he can also create new locks to fit the motifs and textures demanded by contemporary designers and architects--from medieval revival to postmodern. "2019 #1". Steel case. Steel shackle. Steel key. 3 1/8" high x 1 7/8" wide x 7/8" deep. Key length: 2 3/8". Single bolt mechanism. Designed by: Kevin P. Moreau. Mfg by: Kevin P. Moreau. "2019 #2". Steel case. Steel shackle. Steel key. 3" high x 2 3/16" wide x 9/16" deep. Key length: 2 1/8". Single bolt mechanism. 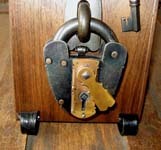 This is a reproduction of the European 16-17 c Triangle Padlock. I like to call this lock the "two Penny" lock, as I believe that would have been the cost of the original. Designed by: Kevin P. Moreau. Mfg by: Kevin P. Moreau. "2019 #3". Steel case. Steel shackle. Steel key. 3 3/4" high x 2 3/8" wide x 1" deep. Key length: 2 1/2". Single bolt mechanism. 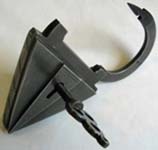 This is a reproduction of the European 16-17 c Triangle Padlock. Designed by: Kevin P. Moreau. Mfg by: Kevin P. Moreau. "2019 #4". Steel case. Steel shackle. Size #1. Single bolt mechanism. 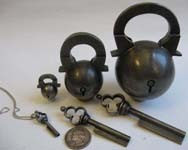 This is a reproduction of the European 17 c Ball Padlock. Designed by: Kevin P. Moreau. Mfg by: Kevin P. Moreau. "2019 #5". Steel case. Steel shackle. Steel key. 4 1/4"" high x 3" wide x 1 1/2" deep. Single bolt mechanism. 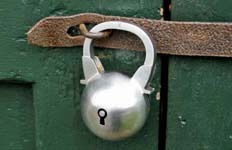 This is a reproduction of the European 17 c Cloverleaf Padlock. Designed by: Kevin P. Moreau. Mfg by: Kevin P. Moreau. Armory. Designed by: Kevin P. Moreau. Mfg by: Kevin P. Moreau. Ball. 3 7/8" high x 3" wide x 2 1/2" deep. Steel case. Two steel shackles. 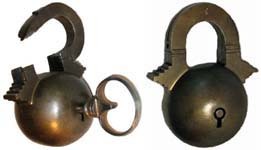 This is a rendering of the popular 17th century "Ball" lock. Designed by: Kevin P. Moreau. Mfg by: Kevin P. Moreau, 2007. Ball. 3 sizes. Size 1: 1 1/8" high x 3/4" diameter. Size 2: 1 1/2" diameter. Size 3: 2 1/4" diameter. Steel case. Steel shackle. 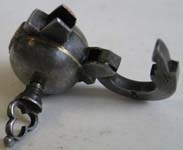 This is a rendering of the popular 17th century "Ball" lock. Designed by: Kevin P. Moreau. Mfg by: Kevin P. Moreau, 2018. Ball - "018". 1 1/16" high. Steel case. Steel shackle. This is a rendering of the popular 17th century "Ball" lock. Designed by: Kevin P. Moreau. Mfg by: Kevin P. Moreau, 2018. Ball - "2018" - "#14". 2 1/2" high x 1 1/2" wide. Steel case. Steel shackle. Key length: 2 7/8". This is a rendering of the popular 17th century "Ball" lock. Designed by: Kevin P. Moreau. Mfg by: Kevin P. Moreau, 2018. Ball - "2018 PFW" - "#9". 4" high x 2 1/4" diameter. Steel case. Laminated steel shackle. Drop-In key chamber. Spring shackle. Laminated steel provided by Kim Thomas, Thomas Iron Works. This is a rendering of the popular 17th century "Ball" lock. Designed by: Kevin P. Moreau. Mfg by: Kevin P. Moreau, 2018. Charlestown - Ball. Designed by: Kevin P. Moreau. Mfg by: Kevin P. Moreau. Gardner. Designed by: Kevin P. Moreau. Mfg by: Kevin P. Moreau. Half Ball. 1 1/2" diameter. Steel case. Steel shackle. Naif engraved decoration. 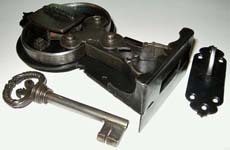 This is a rendering of the popular 17th century "Half Ball" lock. Designed by: Kevin P. Moreau. Mfg by: Kevin P. Moreau, 2018. Jamestown. Designed by: Kevin P. Moreau. Mfg by: Kevin P. Moreau. Lightning - Trick. 6 1/2" high including clevis. Steel case. Steel shackle. Bronze dust guard. This lock requires 4 moves to open. Designed by: Kevin P. Moreau. Mfg by: Kevin P. Moreau, 2009. Sorber. Designed by: Kevin P. Moreau. Mfg by: Kevin P. Moreau. Triangle - Trick. 5 7/8" high x 4 1/4" wide. Weight: 2.5lbs. Mild and laminated high alloy steel construction. 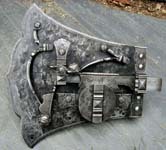 Shackle is steel laminated by Kim Thomas. Designed by: Kevin P. Moreau. Mfg by: Kevin P. Moreau, 2018. Whitechapel. Designed by: Kevin P. Moreau. Mfg by: Kevin P. Moreau.